Our Price £14.30 Another currency? Many nurseries or herb farm businesses can begin life on a small scale in the home garden. It's often amazing how much can be produced, and the profit that can be made from a few hundred square metres of land. This book arms you with the basic information you need to make a start. It's easy to read, and provides a rare insight into possibilities - in a way not commonly found in other books. This is a revised and expanded edition of a book first published by Night Owl Press. It reflects changes in horticultural practice and botanical classification. This revised second edition contains a new chapter and is devoted to setting up a commercial herb farm. 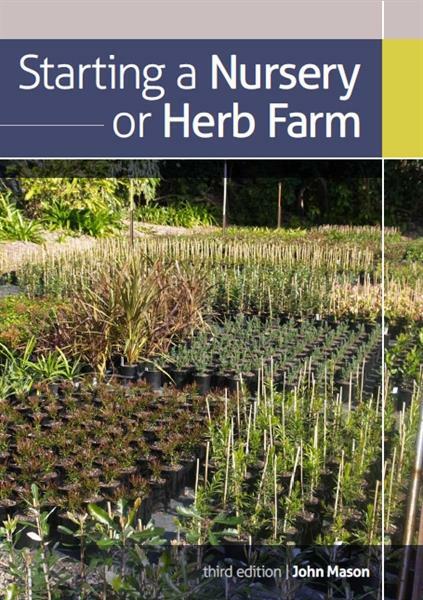 The ebook deals with capital, land requirements, the distribution and marketing of herbs domestically and overseas; and includes a feasability exercise for intending herb farmers. Further chapters delve into the history of nurseries and provide information on both a herb farm and nursery environment. A directory at the end of the book contains references for suppliers of seed, equipment, media, etc. There is also a comprehensive glossary and easy to follow information guide to available horticultural courses. John Mason has had over 35 years experience in the fields of Horticulture, Recreation, Education and Journalism. He has extensive experience both as a public servant, and as a small business owner. John has held positions ranging from Director of Parks and Recreation (City of Essendon) to magazine editor. John is a well respected member of many professional associations, and author of over thirty five books and of over two thousand magazine articles. Even today, John continues to write books for various publishers including Simon and Shuster, and Landlinks Press (CSIRO Publishing). All too often, people enter horticulture with very definite pre-judged ideas on what they will grow, where they will grow it and how they will grow it. While such people have a real advantage in that they obviously love that particular type of plant they can only benefit by giving objective consideration to all the alternatives. Grown outside in the northern parts of Australia; the same are often grown indoors in cooler parts. Soft-wooded (herbaceous) plants grown for decoration. Also corms, rhizomes and tubers grown for flower, often with perennials. Woody plants not native to Australia grown for nonproductive or amenity purposes. Often nurseries specialise in one particular group of exotics (e.g. azaleas, geraniums or cacti). Deciduous fruit tree nurseries usually also grow deciduous ornamental trees which require similar techniques and treatment. Some specialise in citrus or berries. Either grown in containers or in the ground. Herbs grown en masse, the foliage being cropped and perhaps dried or oil extracted for sale. preserves). When considering the alternative crops, there are a number of questions to which you must find the answers. How well does the product keep? lf it can’t be sold immediately, can it be potted up? Will it still be salable in a month or a year? How long does it take to become salable? Some operations (e.g. selling 5 cm tube-size plants) can give a return in three or four months from starting, while others (e.g. citrus trees) can take up to seven years from starting the rootstock to selling the budded plant. What will be your peak work times? Different types of operations will impose heavy or light workloads at different times of the year. Deciduous plants require budding in February-March and digging for sale in winter. The remainder of the year is lighter work. Retail nurseries or herb farms are very busy in spring and to a lesser degree in autumn, although summer is very slow. Want to get more serious?